Work to be performed, having different modules that are adapted on the cross carrier assembly this allows the machine along with the weld from 3 370 to 4070. The turning tool holder is mounted via the Z carriage. Work is performed via the surface grooving, boring bevelling, milling hydraulic drive power as 5 KW -200 RPM-30 daN.M. The SA40 spindle is perfect for all types of milling tools, carbon high speed. The electric drive measures 360 V, 2,2KW -1,200 to 1,900 RPM-14 N.M the grinding wheel has varying speeds of 3,000 to 6000 RPM. 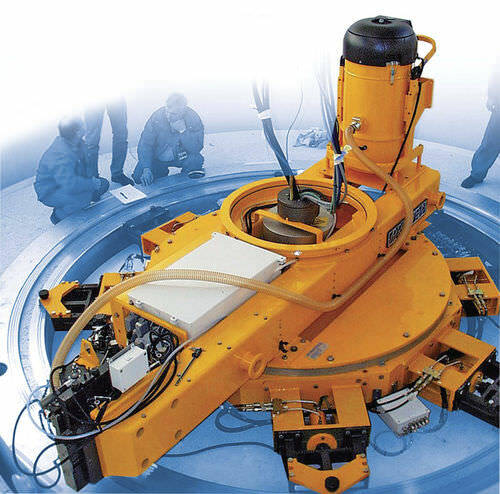 Unit can be used for Æ 120 to 150 mm grinding wheels Welding modules. MIG welder is used for reactor vessel cladding. TIG welding is used for reactor vessel cladding Upside down assembling and for over head welding. The weight is 4500 kgs Hydraulic Power Pack: Power: 11 kW. 2 and there is variable flow pumps used for motors and milling. The high pressure pump is used for cylinders.